Fed up of your stomach somersaulting every time you drop your phone? It’s time you give it some armour. The fact that you’re looking at this page makes us think that you’re either fed up of walking shamefully into your local repair store to get the screen replaced or you’ve just bought the latest model in all its glory and the very thought of dropping it straight out of the box fills you with dread. So now you’re here, let us introduce you to the world of iPhone cases. Specifically want top cases for iPhone X? Head this way. Beyond the tons and tons of plastic iPhone cases with dodgy-looking patterns that are available in shops, stalls and on the internet, there’s a market of cases that go above and beyond their call of duty to not only provide you with the coolest dressed phone on the block, but come into their own when it comes to enhancing your phone’s performance and making your life that just that much easier. 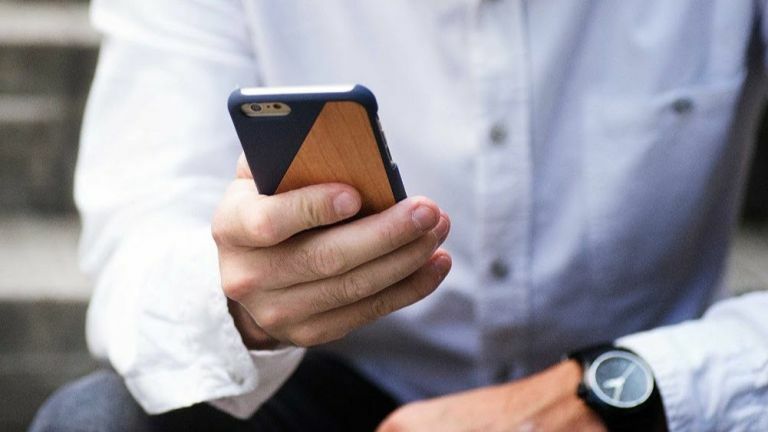 From smart leather iPhone cases with card slots to ultra heavy duty ones that give your phone the strength of a brick, our list will broaden your mind to the extent of the best iPhone cases to buy right now. Who says a case has to be made from plastic? The man on the street is often a few generations behind the latest release, so this case built for iPhones 6 and 7 should be fine for the majority of us. Made from a mix of TPU and walnut, the design of this case is very mature and stylish, so when your phone’s faced down, it’ll look like it’s been taken straight out of a catalogue, rather than picked up from the local market. Native say thanks to the unique configuration of natural grains, each case is truly individual, which makes it a pretty cool gift idea too. If you use your iPhone on the go, you’re probably well aware of the dreaded bleep that tells you your battery is about to drop dead halfway through an important phone call. Now, you no longer have to worry. This case offers up an additional 25 hours talk time and 18 hours internet time (providing the phone is set to LTE mode). If you can see past the fact that your phone will appear bulkier in your hand, this could be great buy. You can also charge your phone up and the case at the same time. Handy. It’s no secret that the iPhone X costs a small fortune and if you’ve said no to the annual all-inclusive holiday with your mates because you can’t help being a gadget nerd, you should probably make sure you protect it with your life, never mind a silicone case. No matter what you choose to spend your hard earned cash on, you can’t deny the beauty of the design of the iPhone X, so why hide it under a bulky case? This case fits the iPhone X like a moulded trainer to your foot, but you still need to be careful not to drop it. Otterbox have put a lot of thought into this folio case. They claim that the case has been subjected to enough testing to prove that it protects your iPhone X without taking away from its slim figure profile. There’s an inside pocket where you can slip in cards or notes, allowing you to keep everything one place for emergency run-outs to the supermarket or for nights out. Reviewers love the style of it, but some find that it sometimes muffles the microphone. Whether you’re shredding the mountain or hitting the rapids, taking your iPhone is never a good idea.. Until now. Forget forking out on a GoPro, everything you need to capture incredible shots of your adventures is right here is this phone case. Completely waterproof to 33 feet and able to survive drops of 20 feet, this iPhone case come lens mounter is pretty much life-proof. With 4 interchangeable lenses included and a range of accessories available to purchase separately, this case is a must for thrill-seekers. If there’s absolutely no denying that you can’t walk in a straight line without narrowly avoiding a catastrophic incident, you should probably think about purchasing this case. The confidence is there in the polycarbonate exterior, and reviewers agree that it’s solid and hard wearing. It comes with an in-built screen protector and a belt clip, so it’s ready for whatever your life can throw at it. It’s not as brick-like as other bricky cases out there, but it’s still fairly bricky, if you catch our drift. If you like the look of our 4th pick but can’t quite justify the price, you’ll be pleased to learn that this one is much cheaper. No, you’re not getting real leather, but reviewers seem happy with the quality all the same. The case can also be turned on its side and used as a stand so you can easily watch films or episodes on the go. If you’re forever losing your cards or forgetting your wallet, you can keep everything you need in one place too.